Sixty players from Gilkock Football Academy Brufut branch on Sunday January 28th completed a four day training course on HIV/AIDS at the Brufut Lower Basic School as part of fulfilling its aims of enlightening its players on the deadly disease rocking Africa. The participants were drawn from all the categories of the academy with each team presenting twenty players. Addressing the participants in the opening ceremony Mr. Buba k Jallow the technical director outlined the importance of such training on HIV as players are always vulnerable due to their fame. Boris Demba, Alieu Sanneh and Sang Mendy also echoed similar sentiments and urges donors groups to fund such activities. On her part Mrs Marie Joof, who works as a nurse here, thanked the academy for the good job they are doing in trying to sensitize the young players on the deadly disease and other sexually transmitted diseases. 4. Relationship between HIV and football. The four day training was organized by the academy and hopes to organize others in the future especially in the summer and hope that donor companies will fund this noble cause. About fifty players of Gilkock Football Academy, Brufut Branch on Saturday traveled to the Independence Stadium to watch Ebrima Jatta Brufut's first players to ever play in an international game. Ebrima showcased himself in a game against an Ivory Coast team called J.S Dangelle in the Confederation of African Football Cup Winners Cups his team Hawks was the FA Cup winners in the Gambia last season. Addressing the Gilkock players on Sunday in Brufut at the training ground, Ebrima who had a terrific game thanked them for watching and cheering him and also urges them to listen to their coaches and train harder to beat his record. However, Buba k Jallow the Technical Director of the Brufut Academy hailed Ebrima for his brilliant performance. Sang Mendy who also watched Ebrima grow from strength to strength through the academy to where he is today said, "Tall lanky Ebrima have a lot to offer if given the chance'. Mendy also advised Ebrima to keep it up as he has inspired all the young players of the Brufut Academy because everyone in the academy is seeing him as a role model. Ebrima can play as a central defense and also as at central midfield. 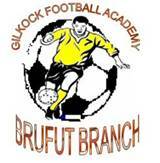 This weekend marks importance in the calendar of Gilkock Football Academy, Brufut Branch when 150 players in and around Brufut gathered at the academy's training ground for trials. Speaking to these players before the start of the trials, coach Boris Demba advised the players to be composed, relaxed and be disciplined. On his part Mr. Buba k Jallow told them about the needs and criteria of the selection whilst Sang Mendy, Ebrima Jatta and other senior players thanked the players for coming and said that 'this is going to increase more competition within the academy and through this Brufut United coaches can have a host of players already trained and fit technically and tactically to select from. At the end of the selection on Sunday fifty players were selected and will be subjected a more vigorous screening later during the coming weeks. The players were from the ages of 6-15. After the final selection on Sunday 28th the Brufut Academy received a guest team from the Ebo Town Football Academy for a friendly. The visitors Ebo Town Football Academy lost the two games played. In the under 9's the Brufut Academy beat the visitors by 2-0 whilst in the U-12s the visitors lost by 3-1 a performance hailed by the community of Brufut after the game. Coaches of the two academies were pleased with the performances of their players and pledges to build partnership in the future.